See how to sign up for USA Today's bracket challenge. 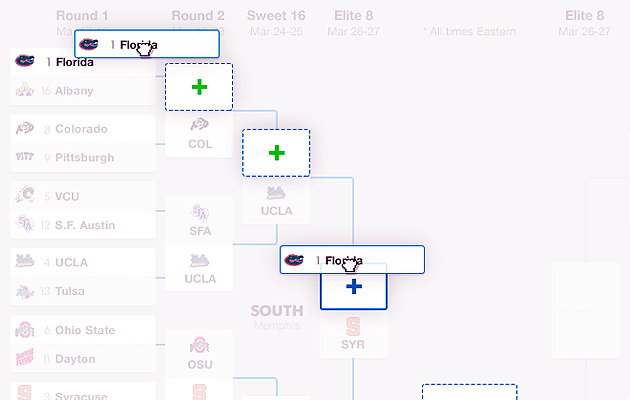 SI's bracket challenge, in partnership with USA Today, is a fun new interactive bracket, designed for speed and convenience. You and your friends will enjoy a mobile-optimized experience throughout the NCAA basketball Tournament, with up to the minute news and updates. Follow the instructions below to play. Register with your email address or sign in with your Facebook or Google account. After signing in, you will be directed to your “Picks & Pools” screen, where your brackets and pools will be stored. A pool is a private group competition between you and the people you invite. Setting up a pool is quick and easy. Just give it a name and add comments for your guests. You can set up any number of pools, right up until the start of the first tournament game on March 17th. See below for how to create a bracket for your pool. After creating a pool, you may share your pool’s unique URL with friends. 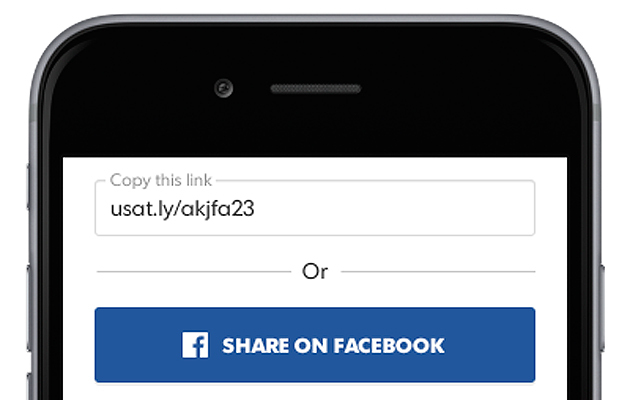 Simply copy and paste the URL, or click the share buttons to broadcast it to your social networks or via email. Your friends will be able to join immediately, and submit a bracket to that pool on March 13th, once the tournament seeds are set. Your friends may join your pool until the first tournament game starts on Thursday, March 17th. If another user has invited you to join his or her pool, follow the private link to their pool and click the “Join Pool” button. If you aren’t yet signed in, you’ll be asked to do so. You can join as many pools as you like until the first tournament game starts on Thursday, March 17th. Once the tournament seeds are set on March 13th, you will also need to submit a bracket. You may choose to select from your existing brackets as you join, create a new one, or create one later. Remember, you will not officially become a ranked member of a pool until you have submitted a bracket. If you have tentatively joined a pool before creating a bracket, you can always revisit the private pool link (from your “Picks & Pools” page) to submit a bracket and become an official member. Once the tournament seeds are set on Sunday, March 13th, you may fill out a bracket and submit it to your pool(s). If you only create one bracket, it will be added to your pools by default. You can create as many brackets as you like. You can edit your bracket at any time until the first tournament game starts on Thursday, March 17th. Once the tournament begins, brackets are locked in so you can review your bracket’s performance in real time. Creating a bracket takes just a few minutes. Simply click or tap a team from each matchup to advance to the next round. When you’re happy with your picks, just name and submit your bracket. You may submit an incomplete bracket to finish later. Leaving a bracket incomplete is allowed, but for your best success, it’s not recommended. Desktop users can even drag a team to advance multiple rounds at once, or all the way to the national champion spot. Simply click and drag the team logo into one of the green drop zones. 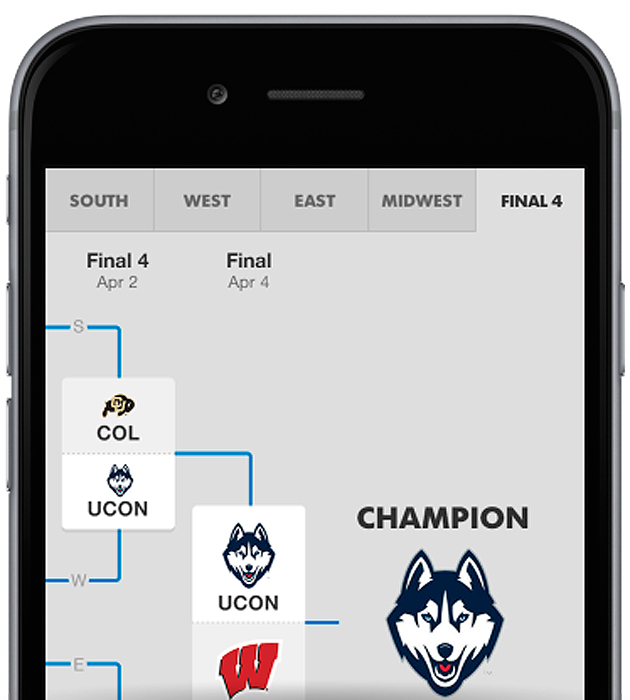 Mobile users will see one region (East, West, South, Midwest, Final 4) at a time. Fill out each region completely, and then hit the “Next” button or a region tab above to complete the next region’s picks. TIP: Don’t forget to select a winner of the final matchup in each region (Elite 8) to advance to the Final 4 tab. Upon completion of all five tabs, name your bracket and submit it to your “Picks & Pools” page. Once your bracket has been successfully submitted, it will appear on your “Picks & Pools” page. From there, you may add it to pools you have joined, including your own. Just click the link to any pool and select your existing bracket from the menu. Then click the “Join Pool” or “Save Changes” button. Your bracket collects points for each winner you correctly predict. In each round the points are doubled. As each round of games is played, you will see your bracket’s score increase and the potential points remaining decrease. A perfect bracket will score 192 points. But don’t worry. That’s a long shot. All brackets will be automatically submitted to the USA TODAY Sports Overall Pool. The top 100 brackets will be listed publicly on the Leaderboard page. • Be sure to make at least one pick before hitting submit. Partially complete brackets are allowed, but will likely hurt your score. • Check to see if your bracket has the same name as another bracket you’ve made. • Make sure you are logged in. • To be officially entered into the pool, be sure to create a bracket or add a bracket on the pool’s page by selecting from the options in the select menu (after March 13).